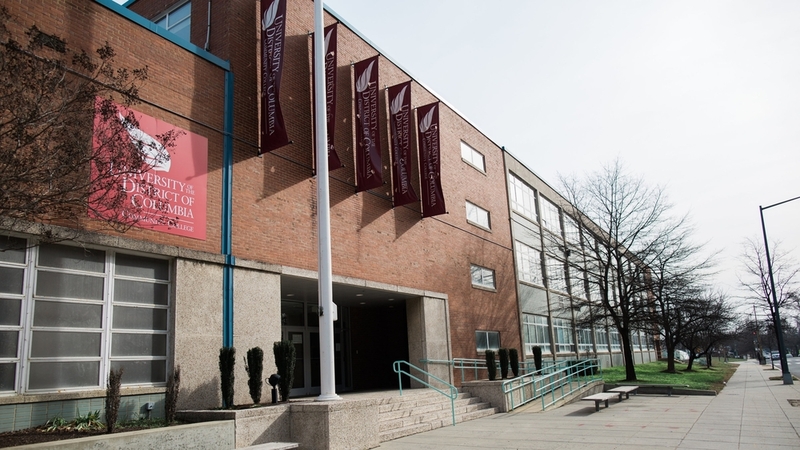 The project scope involved a 70,000 square foot renovation at The University of the District of Columbia Community College Bertie Backus Building. This was an intermediate phase of renovations at the former Bertie Backus Middle School. The envelope of Bertie Backus was built in 1964 and was originally designed with heating systems only. In collaboration with Leo A Daly Architects, Designtech worked to retrofit and modernize an existing wing of the occupied building. The modernization helped UDC-CC to meet current building codes as well as meet their space function needs. 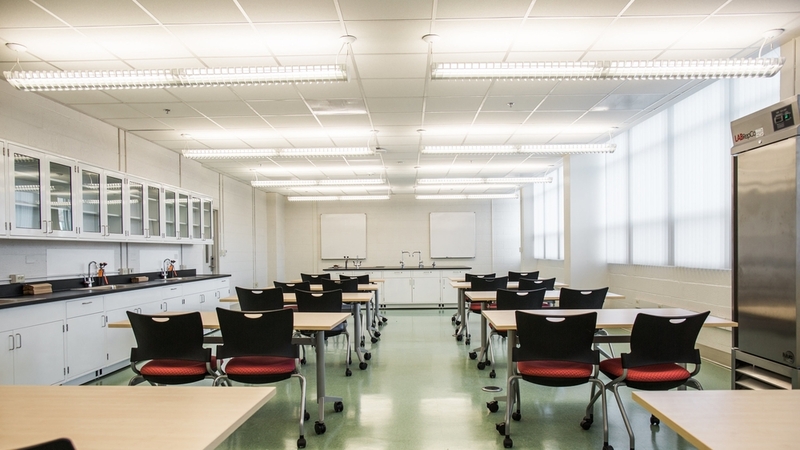 In this case, the majority of the classrooms became flexible lab spaces. The mechanical design included a new Addison dedicated outside air system that provided mechanical ventilation for interior spaces. Natural ventilation was provided for perimeter spaces through the use of operable windows. Space heating and cooling was designed as a variable refrigerant flow system (VRF) by LG. 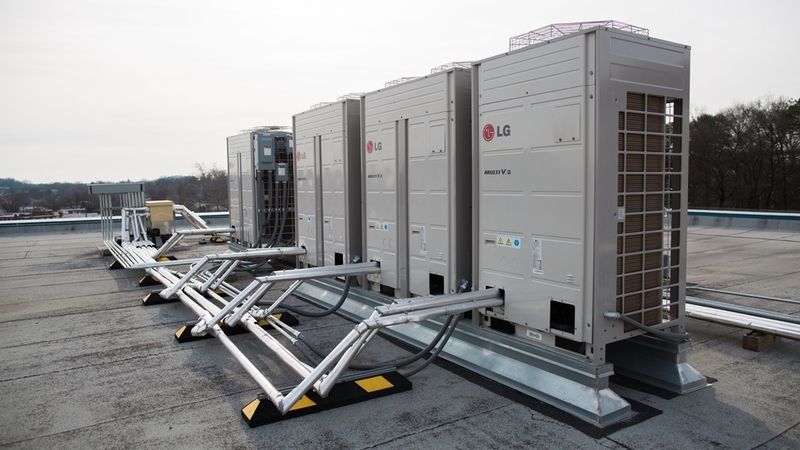 Each chassis of condensing units pictured above provides heating and cooling for one floor of the renovated wing. The indoor air handlers are ceiling mounted cassette type units. VRF was extremely helpful in the retrofit process because of the lack of space for new large ductwork in the school. The only mechanical heating and cooling distribution is a network of small refrigerant pipes above the ceiling. This allowed the ceilings to remain 18-24 inches higher than if a traditional air conditioning system was installed. Plumbing design included new lab sinks and water fountains as well as natural gas service for mechanical equipment and lab spaces. Electrical design included an electrical service upgrade for future growth; specifically the renovation of the auditorium. Electrical design also included the power distribution to the new mechanical equipment in addition to new high efficiency lighting.